The Raiden series is one of the original trailblazers in the arcade shoot 'em up genre, with a rich 27-year history of high intensity bullet-dodging action. Featuring a fully narrated campaign, Raiden V takes players to the skies of real-life locations like New York, Paris and London for the first time in series history. After the most powerful weapons on the planet are taken over by alien Cranassians, the Raiden supersonic attack fighter squad is scrambled to counter the alien threat and save earth from complete devastation. 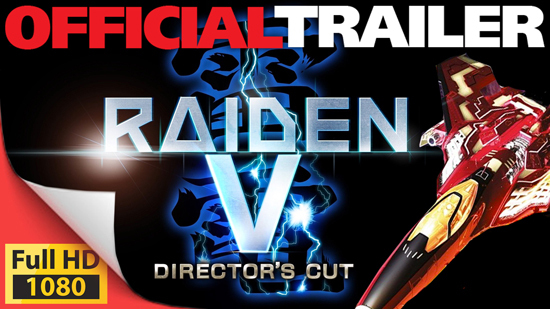 Don your flight suit and strap in for the ultimate shoot ‘em up experience with Raiden V: Director's Cut! Health Bars – The days of one hit and you're dead are gone, but keep an eye on your ship's health if you want to make it to your final destination! PS4 Limited Edition – Physical edition includes an exclusive Raiden V Soundtrack CD! Multiplayer – Take on the alien threat in local 2-player cooperative play! Extra Levels – All-new exclusive levels are included for more intense Raiden action! Raiden V: Director's Cut is releasing both digitally and physically with a Limited Edition that includes an exclusive Soundtrack CD. Raiden V: Director's Cut barrel-rolls onto PS4 on October 6, 2017!